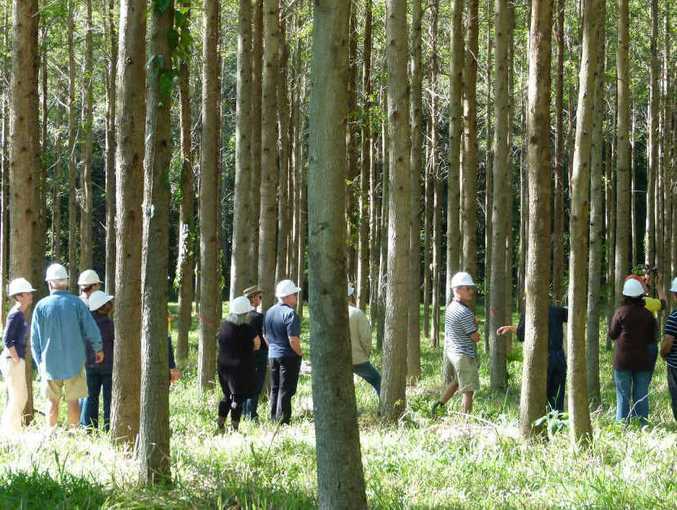 ONE OF a series of regular farm forestry practices field days organised and run by Private Forestry Services Queensland was held on Andrew Sinclair's Kin Kin property. 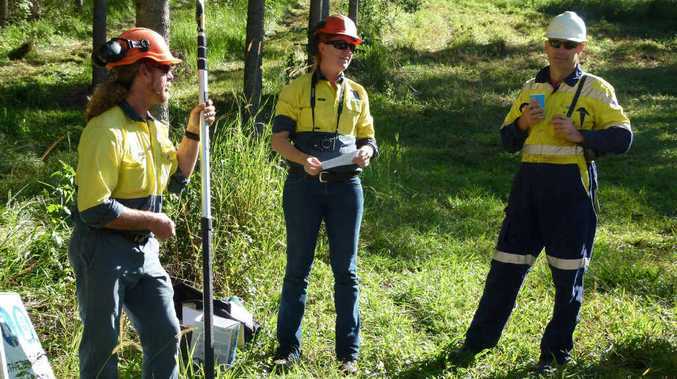 It dealt with first-stage thinning and pruning operations, as it applies to Gympie messmate. Mr Sinclair said the property was originally growing beans, small crops and bananas before becoming home to alternate lifestyles. "As may be expected with that history, weeds were a major problem," he said. "Before we could even think of planting eucalypts, weeds had to be controlled." Now the trees are eight or nine years old, they are suppressing most weeds and the plantation management has changed direction to maximising stem value. "As the plantation has developed, wildlife has returned," Mr Sinclair said. "The environment is much more diversified, especially along the creek." PFSQ's Gary Clark said eucalypts in particular did not appreciate competition, so management must be directed towards minimising competition while still keeping the operation economic. "The best indication of growth is canopy size and health," Mr Clark said. "We aim for tress to have a good canopy while not impacting on neighbours." The canopy drives the increase in trunk diameter. Trees are initially planted close together - 4 x 2.5m - to encourage them to grow up with minimum side branches but over time, are thinned from 1000/ha to about 150/ha, because some will not be growing as well, some will develop twin leaders, or are damaged in some way, or they are growing crooked. The thinning decisions depended on what the end product aim was, Mr Clark said. "I am critical of government plantations that aim for a 2.4m saw log," he said. "Just aiming for one product severely limits options." Farm forestry operations should be about maximizing end use options in order to gain maximum value from every stem, he said. Thinning was a matter of confidence. The first thinning, from 1000 stems/ha down to about 700 was the easiest, as much of what had to be removed was pretty obvious. "Even a poorly grown tree will impact on its neighbours," he said. "Get rid of the stems that are never going to be worth much, they are taking growth away from the good ones." In the thinning process, trees were removed each time the canopy closed over, and that was best done according to tree growth, not on a time basis, for example, at five years old or 10 years, etc. "It may seem a big waste to plant a 1000 trees and finish with 200, but it allows the best to be selected." GREEN FOREST: This well-grown stand of Gympie messmate is in need of the next stage thinning.